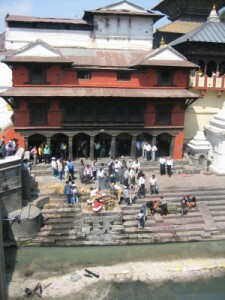 Tour of India and Nepal – Kathmandu. 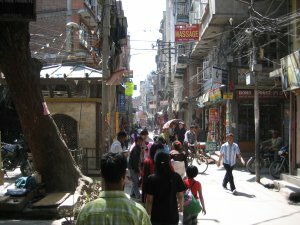 We finally arrive at Kathmandu, a place I felt like I had waited all my life to see.When I got there, it was a bustling city, and reminded me of the dirtier parts of Manchester on a sunny day. Anyway I was here now, and wanted to make the most of it. 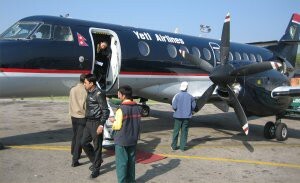 Our first trip was Bouddhnath 6km to the east of Kathmandu. 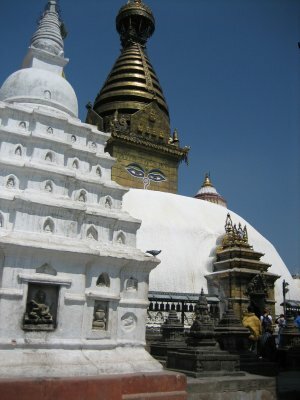 A colossal and ancient stupa (Buddhist temple) and one of the biggest in the world and stands 36m high. 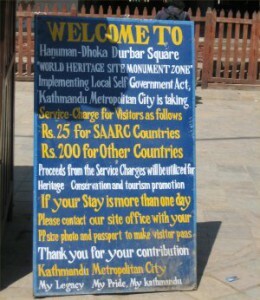 Like many of the things I had seen on this trip, it was a world heritage site. It took its name, meaning dew drops, from a legend that when built dew was mixed with mortar, as there was a drought. A man dressed as a monk, was praying, some people gave him money, then we realised, that he wasn’t actually a monk at all. A woman approached us. We thought she was begging, so declined. She said that she didn’t want money, just asked us if we would buy milk for her baby. It was hard to refuse. We found in reality, the woman, and the shopkeeper were in cahoots. 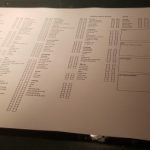 The milk was massively overpriced and when we’d gone they would have split the money. 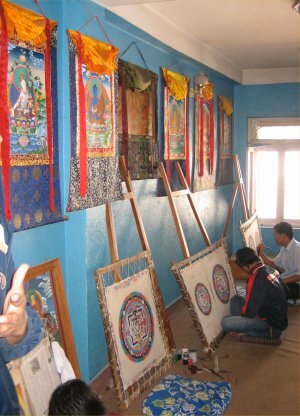 Nearby we went to see how authentic Thangka (Buddhist) painting was done.Some of them were very beautiful, but I had already purchased a picture from a Thali village I was fond of, and the prices here were very expensive. In the centre bottom of this page, is the newest Thangka design, created personally by the Dalhi Lama. They have trained more than 300 artists here. Similar to the burning Ghats I had seen in Varanasi.The dead were brought here, to be ritually burned, this was normally done by the eldest son. 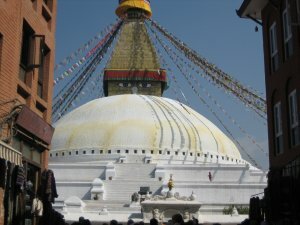 Swayambunath was another Stupa that we visited.The pilgrim’s route to the Swayambunath Stupa is a steep stone staircase of more than 300 steps, often claimed as 365. 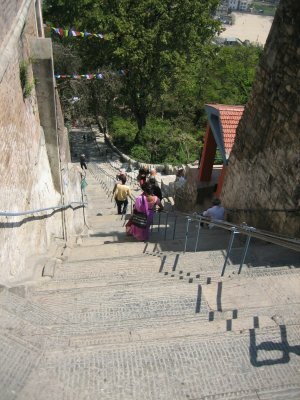 At the base of the staircase is a large, brightly painted gateway. 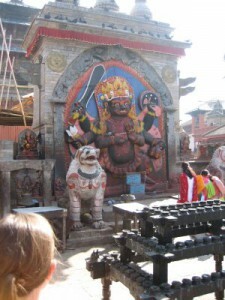 Inside was a massive prayer wheel nearly 12 feet tall that requires two hands to turn. Filled with thousands of prayers, this wheel strikes a bell each time it makes a complete revolution (perhaps just to make sure someone up there is listening). Be sure to give it a spin before beginning the climb to the top of the hill. 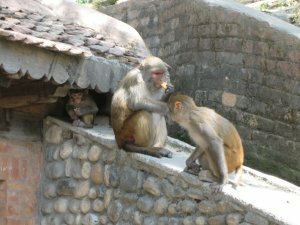 On the way up, I saw some of the monkeys that live here.I was advised to beware, as they carry disease, and can be aggressive. I found that to be good tempered. From the top, there are spectacular views of Kathmandu.The earliest record of its existence dates from a 5th-century stone inscription. Scholars and archaeologists believe that there was probably a shrine here as far back as 2,000 years ago. There were dozens of Buddhist prayer wheels built into the wall around the stupa. 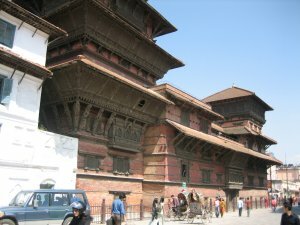 We enter the internationally renowned Durbar Square (this would have been a bit more significant, if we hadn’t visited a Durbar Square in Bhaktapur, the day before).In reality Durbar Square means Palace complex, and isn’t an unusual name at all. Getting back on track, sitting in Durbar Square, drinking coffee and watching the world go by is one of the things I have always wanted to do. 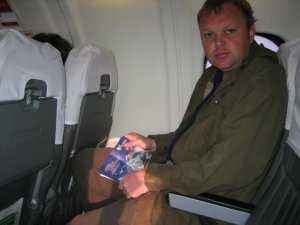 At one point, the civil police stopped us and asked to see our tickets. Many of the streets here, don’t actually have an names, which can be confusing. 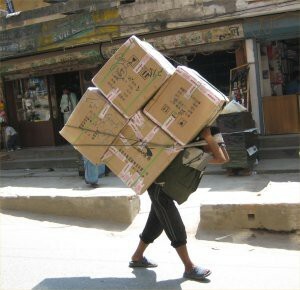 In scorching heat, this chap carries this enormous heavy load. It is believed that the name of Kathmandu City is derived from the name of this temple. Kastha means wood and Mandap means pavilion.We had lunch at rooftop restaurant overlooking the square. 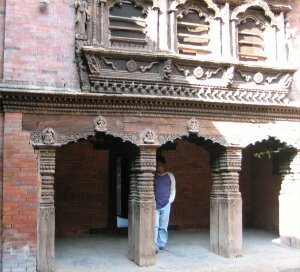 One of the popular temples of Durbar Square, Kashamandap is known locally as Maru Sattal. It is said to be built by single Sal tree. 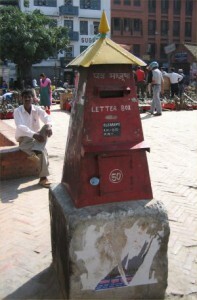 Rather unusual looking postbox.We saw the outside walls of the Royal Palace, but it was closed. There had been a protest the day before, and people had been shot. 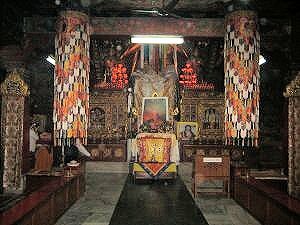 Kumari Ghar is the temple of Kumari – the living Goddess. Kumari is believed to be the bodily incarnation of the goddess Taleju.The current Royal Kumari, Preeti Shakya, was installed in 2001 at the age of four. Both Hindus and Buddhists equally venerate her. The Goddesses social calendar must have been busy on the day we were there, as we weren’t granted an audience from her balcony. There is a square inside the temple, which some of the most amazing carvings I have ever seen and the building is simply majestic. A statue of Bhairab.It shows Shiva in his most fearsome form. He has six arms, carries weapons and a body, has a headdress of skulls, and tramples a corpse. That evening, we have our goodbye dinner. 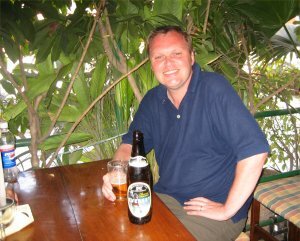 It was sad, I had made some really good friends, and I had soaked up so much of the culture that surrounded me, that I wasn’t sure how I would manage back home.We would be flying home the following evening, so it was our last night out together. 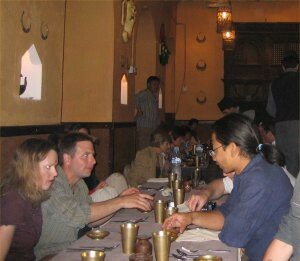 Our guide took is to a superb authentic restaurant, where several dancing birds and yetti’s performed for us. 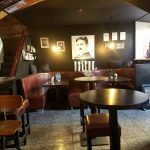 It was uncomfortable sitting on the floor, but after plenty of beers I hardly noticed. 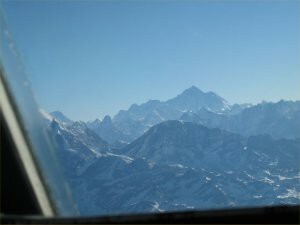 On the last day of our trip, we have a private flight around the Himalayas and and Mount Everest. Although I am an eternal optimist, I know that I will never climb to the top of Everest.As I sat there, I know it was the closest I would ever get to the summit, which was both euphoric and sad at the same time. 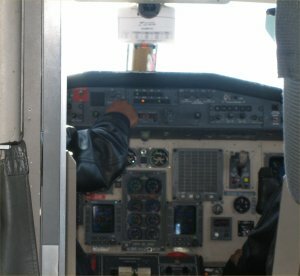 Most unusually we were invited one at a time, to go into the cockpit.I got to look out of the front window, talk to the captain and co-pilot and be shown what the controls do (although they wouldn’t let me touch them). The Summit of mount everest.The rest of the day, I just wandered around Kathmandu and killed time until our flight home. A few of my friends, asked me why I was so quiet (if you know me, its noticeable when I shut up). After seeing the Summit of Everest with my own eyes, I didn’t feel much like chatting. 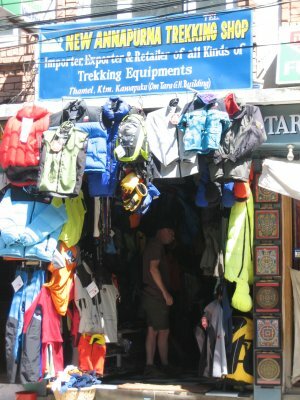 One of the many shops, selling outdoor equipment.Interestingly, many of the items, are made of material from the same supplier as the actual goods and produced by people who have previously worked in an official factory. You can usually only tell the difference by the finishing and the quality of the stitching. 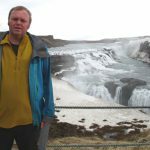 Still, if like me, you think most modern outdoor gear is overpriced and over engineered, it produces a superb alternative. Overall, I was a bit disappointed with Kathmandu. I imagined it as some sort of simple mountaineering town, when in reality it was like walking around a very warm liverpool.You can see from this picture, how busy the backpacker district (where thankfully, we didn’t stay) was. A must see for me, was the Fire and Ice restaurant, said to make the best Pizza’s in Asia.Alan Hinks was interviewed after completing the Challenge 8000 (there are 14 mountains above 8000 metres, at this altitude, the human body cannot acclimatise) more human beings have stood on the moon than the top of all these mountains. Run by an Italian Lady, who has the parmesan made in Lhasa.